The funeral service for Doris M. Nord, 90, of High Forest, will be held at 11 a.m. on Wednesday, July 25, 2018, at High Forest Community Church with Rev. Marcus Quam officiating. Burial will follow at Grandview Memorial Gardens in Rochester. Mrs. Nord died on Friday, July 20, 2018, of natural causes at the Stewartville Care Center, where she had been a resident since 2016. Doris Mae Overkamp was born on Nov. 11, 1927 in Grand Meadow, to Edward and Jana (Bjerke) Overkamp. She grew up on the family farm in rural Grand Meadow and attended country school. She moved with her family to Rochester in 1942 and graduated from Rochester High School in 1945. She was employed at Reichart's Refrigeration in Rochester for a number of years. Doris was married on July 3, 1962 in New Hampton, Iowa to Harold W. Nord. Following their marriage the couple moved to High Forest in 1963 where they raised their children and made their home for many years. 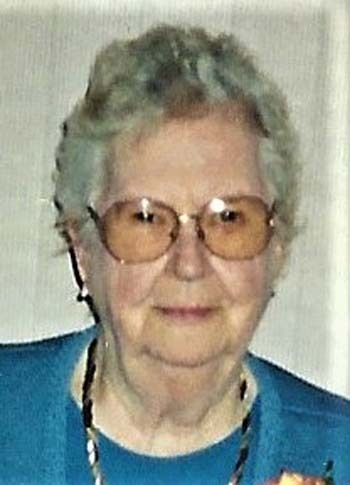 Doris was a homemaker and was also employed in the offices of Watson and then BFI Waste Management in Rochester until her retirement in 1990. Harold was a longtime employee at AMPI Dairy in Rochester. Mr. Nord died on Oct. 25, 1993. Doris moved into Stewartville in 1998. She was a member of High Forest Community Church, the Stewartville American Legion Auxillary Unit #164 and was one of the original members of the Eagles Auxillary in Rochester. She volunteered for many years answering phones with the annual Eagles Cancer Telethon. Doris spent many hours a day knitting "Scrubbies" for friends and family and as word spread, she took orders over the phone and sent Scubbies to people living all over the world - they will be missed! She enjoyed gardening and canning, baking, following the Twins, Vikings and NASCAR. She was a racing fan and with her family spent Friday and Saturday nights going to area stock car and dirt track races. Doris loved time spent with family, especially her grandchildren and great-grandchildren. Doris is survived by her daughter and son, Rick (Glady) of High Forest and Lisa Nord (Terry Cowden) of Pleasant Grove; six grandchildren, Brandon Nord, Brittany DeBoer, Danielle Nord, Tyler Cowden, Nicole Garnatz (Ron Henderson) and Todd Garnatz; five great-grandchildren, Kellen, Taren, Colton, Alivia and Clara; her brother, Jim (Jeanette) Overkamp of Rochester, and nieces and nephews; stepdaughter, Sally (Jerry) Johnston of Wabasha, and stepson, Bruce (Nancy) Nord of Kasson. She was preceded in death by her husband, Harold, her parents, her brother, Gene Overkamp and his wife (Mixi) and stepdaughter, Diana Ramer and stepson, Marvin Nord. A time of visitation for family and friends will take place from 5-7 p.m. today (Tuesday, July 24, 2018), at Griffin-Gray Funeral Home in Stewartville and one hour prior to the service at the church on Wednesday morning. Please feel free to submit your comments. You may remain anonymous. Article comments are not posted immediately to the Web site. Each submission must be approved by the Web site editor, who may edit content for appropriateness. There may be a delay of 24-48 hours for any submission while the web site editor reviews and approves it.